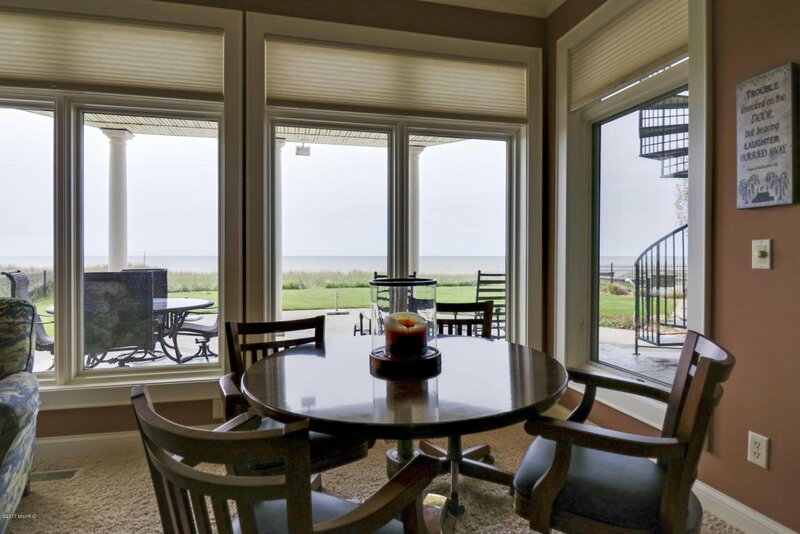 This Glas-built home is the highest standard of luxury. 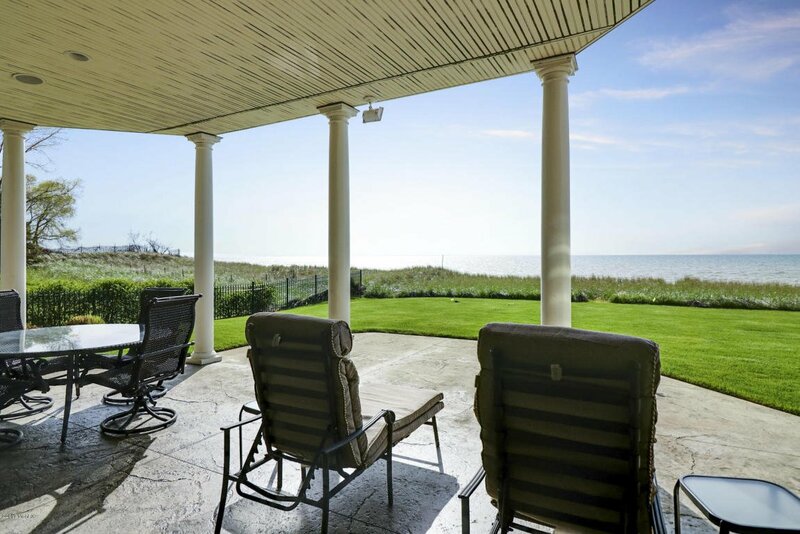 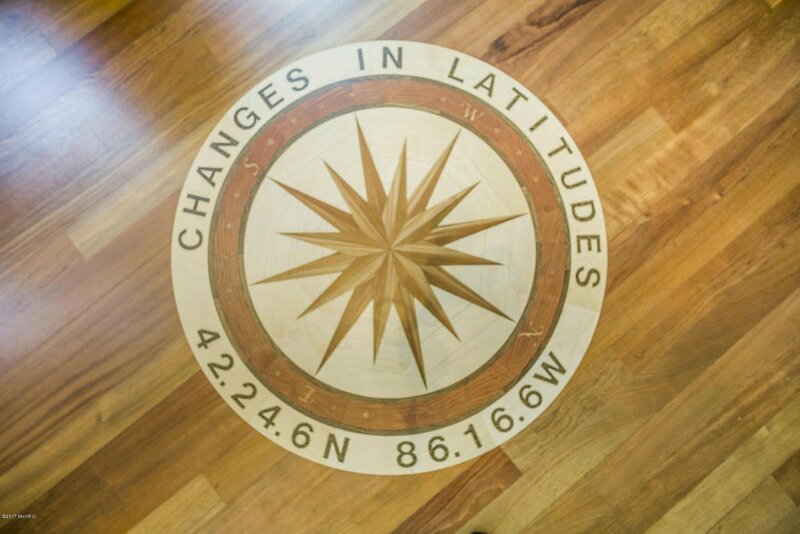 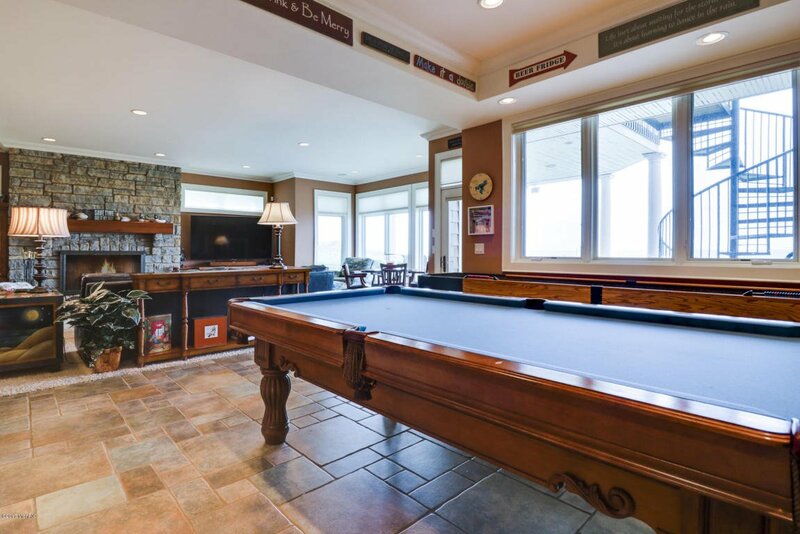 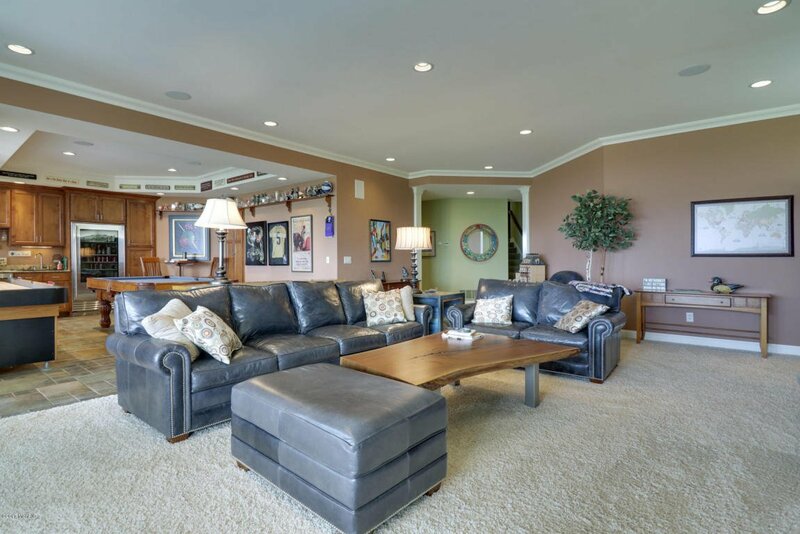 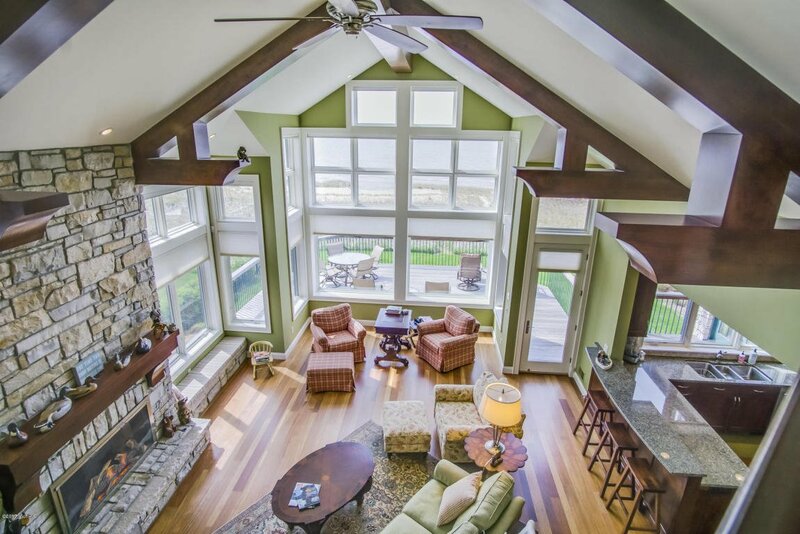 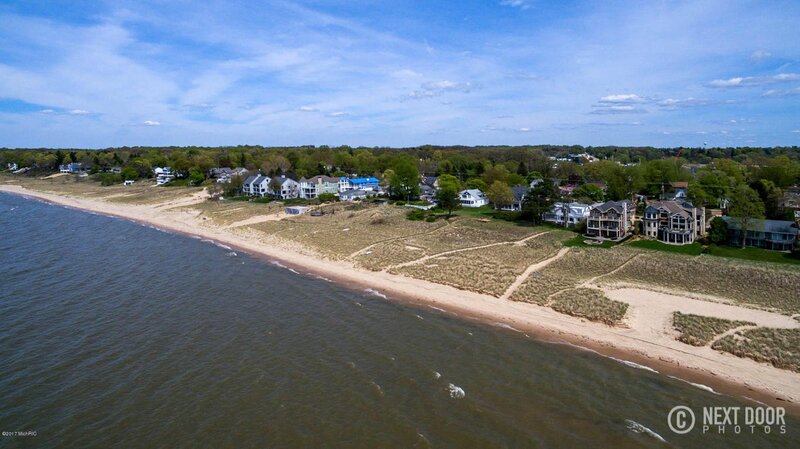 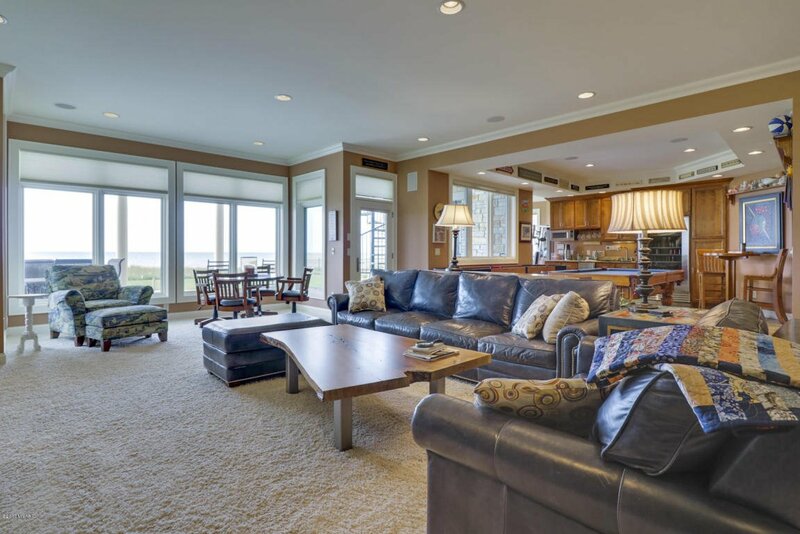 6,588 sq ft of living area with 77' of private, low dune, Lake MI beach. 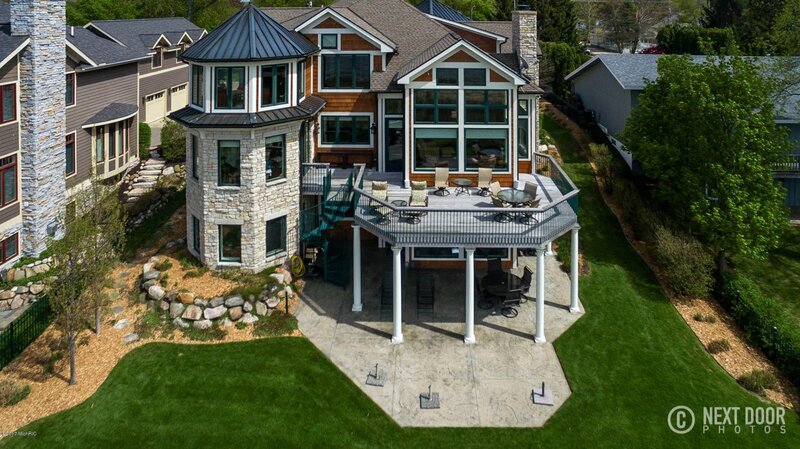 Featuring impressive quality and craftsmanship including 2 story entry with natural tile and stone inlay. 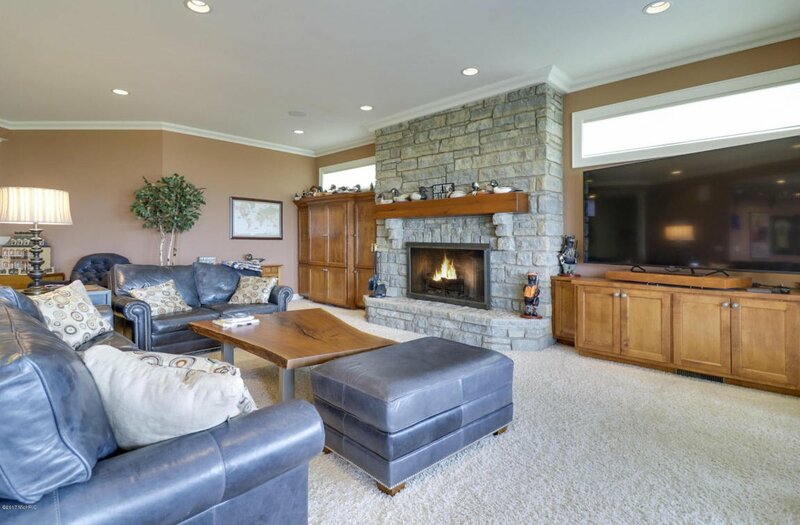 Impressive living room features 2 story vaulted ceiling, natural stone masonry fireplace with Brazilian Cherry hardwood floors. 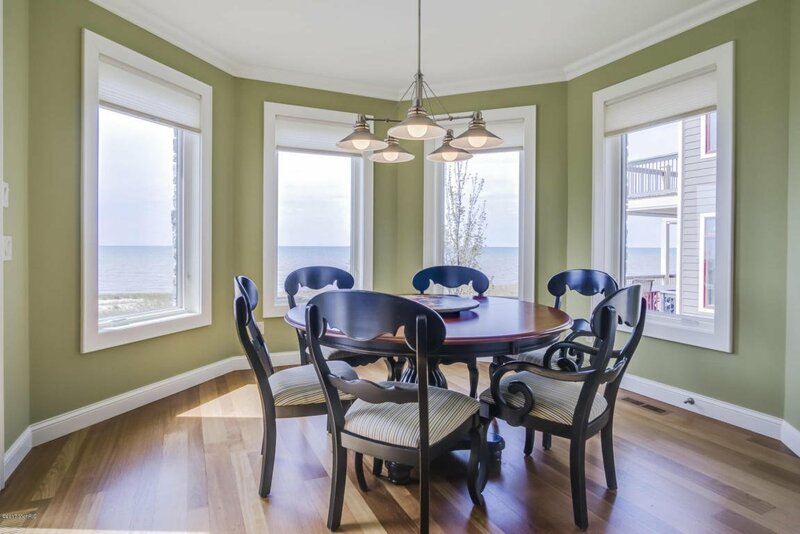 Dining room seats 12 comfortably and has Brazilian Cherry floors with carpet inlay. 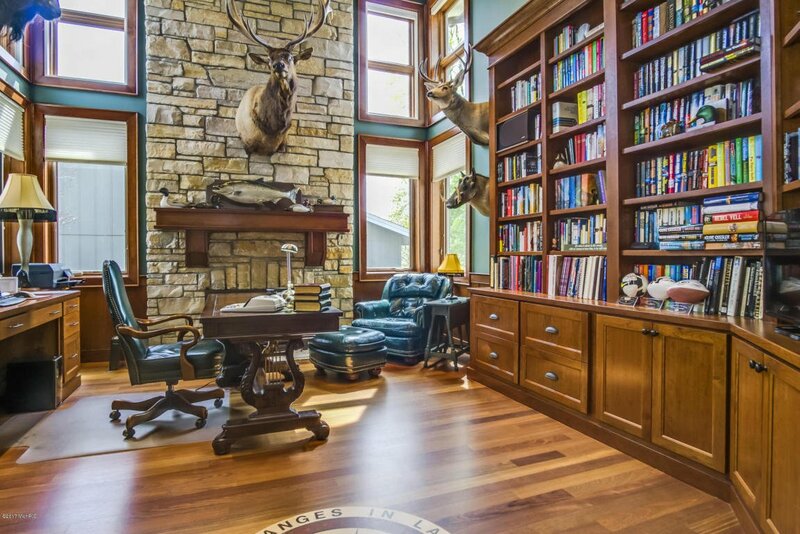 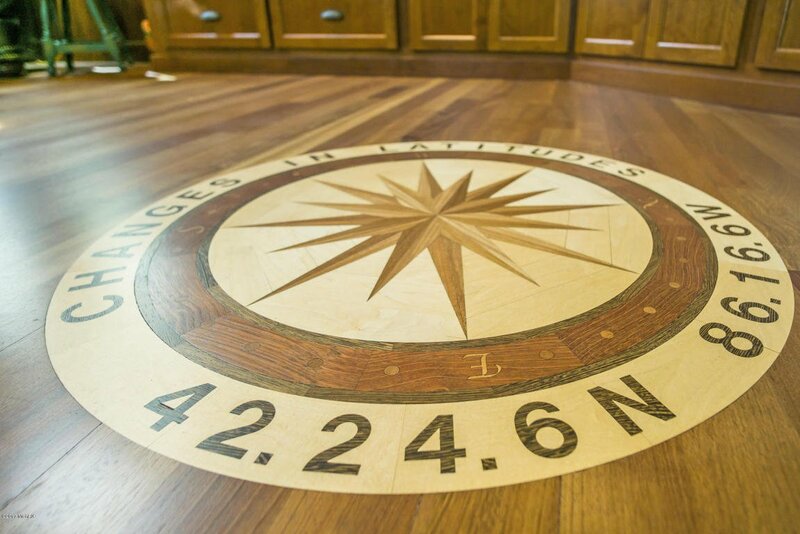 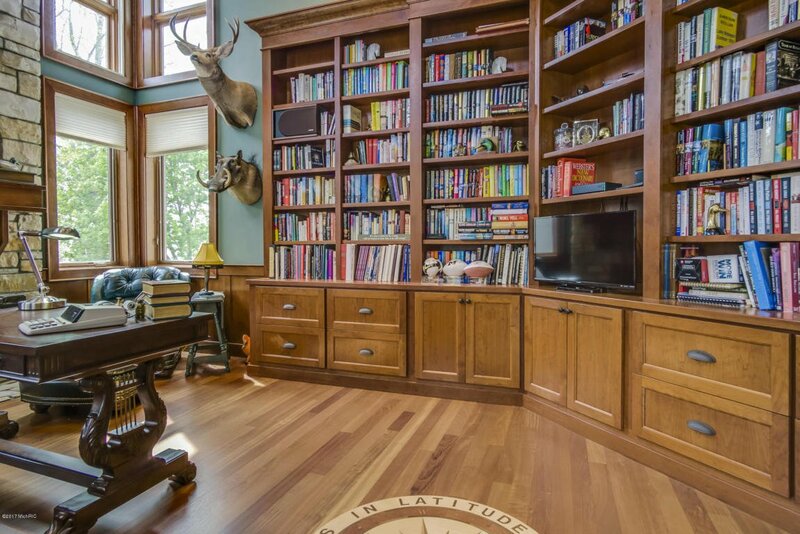 The Den also vaulted, has a custom wood floor inlay, natural stone fireplace and built in cherry bookcases and cabinets. 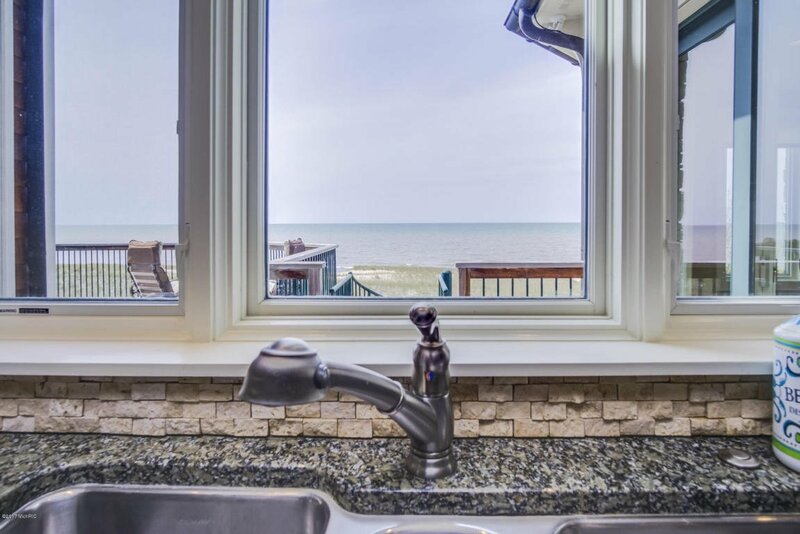 The kitchen windows face the Big Blue and will make any chef sing! 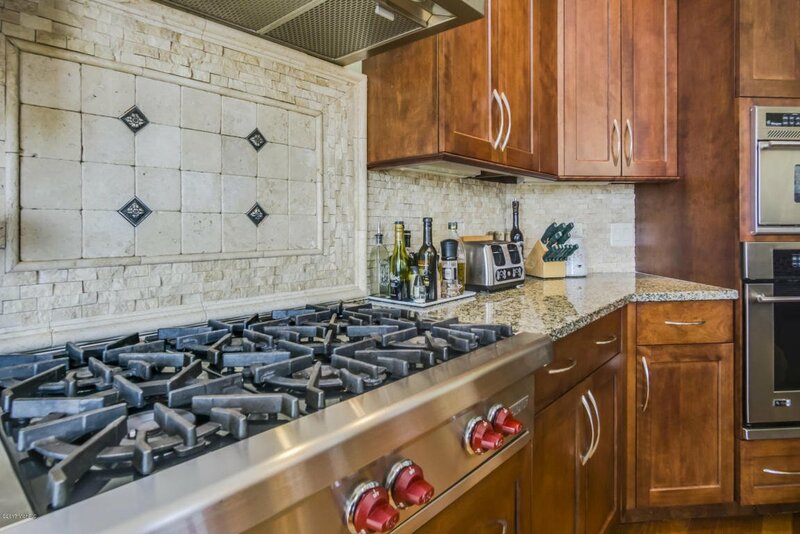 Brazilian Cherry floors, Kirshman Cabinets, Subzero refrigerator/freezer, Wolf 6 burner gas cooktop, Monogram convection oven and microwave. 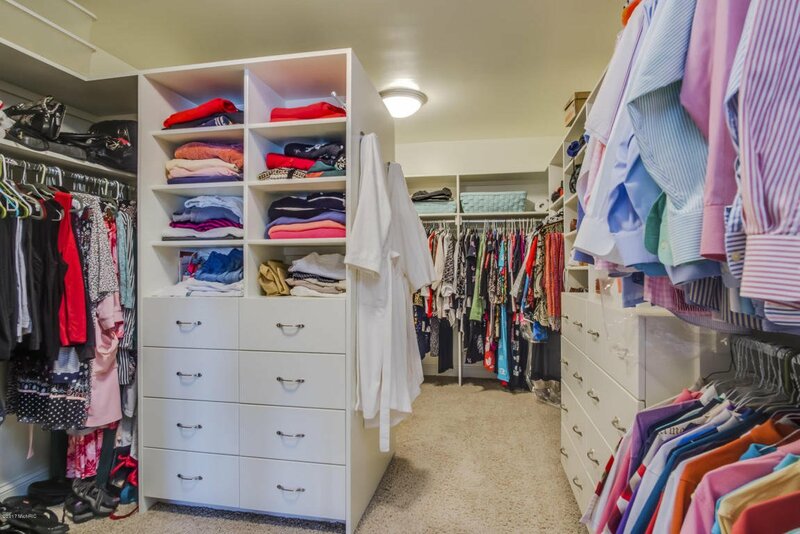 Large walk in pantry. 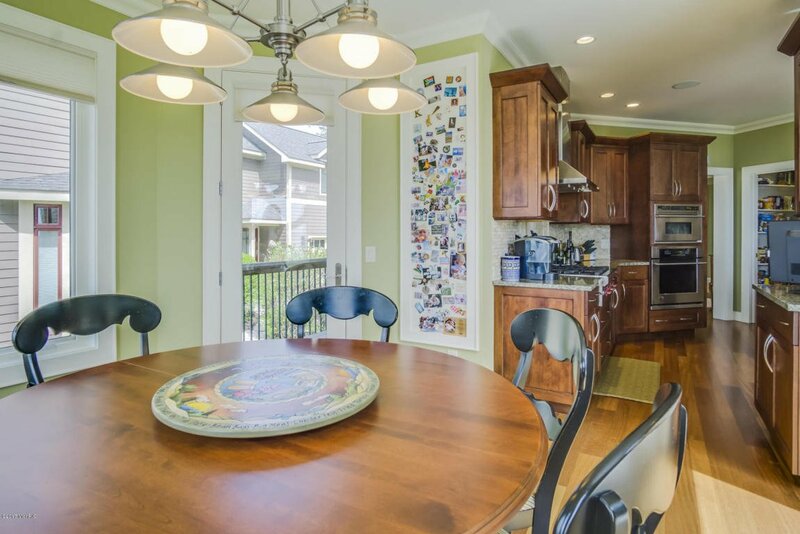 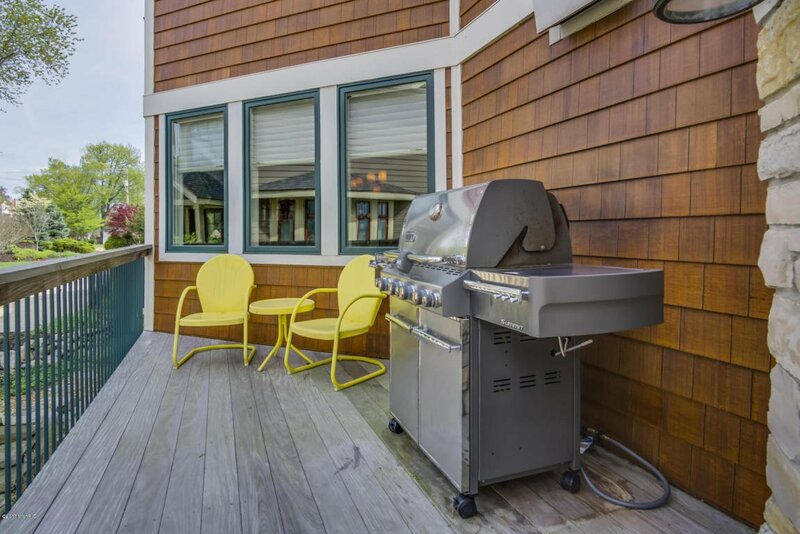 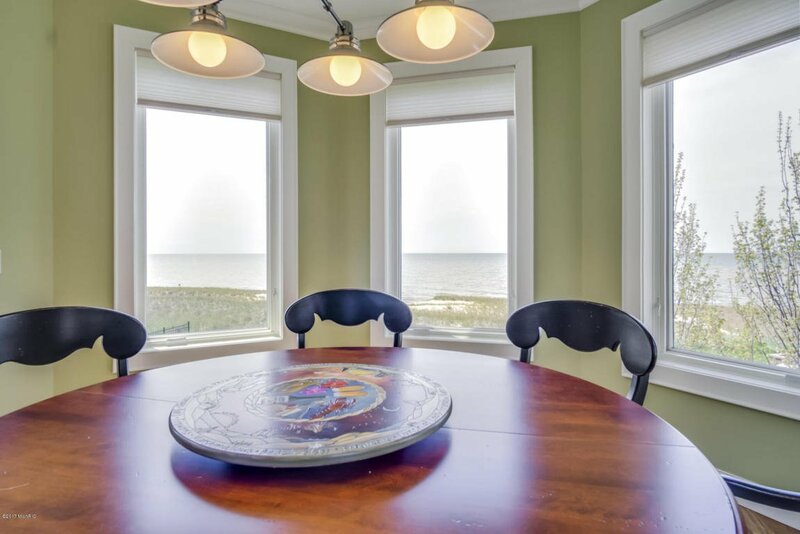 Eating area and formal dining both offer views of the lake. 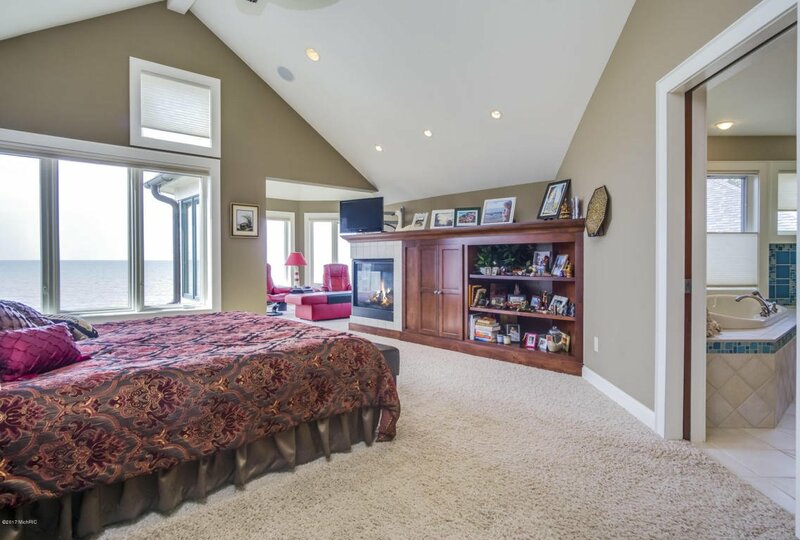 Second floor encompasses the master suite with vaulted sitting room and a gas fireplace. 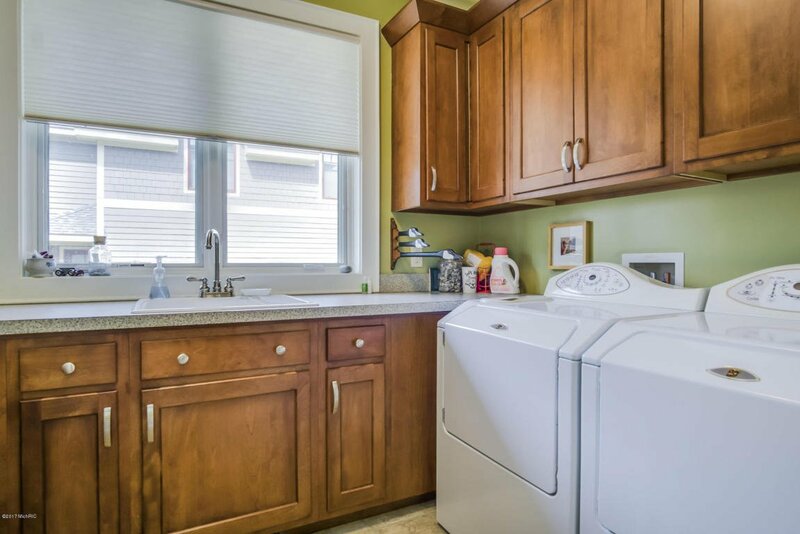 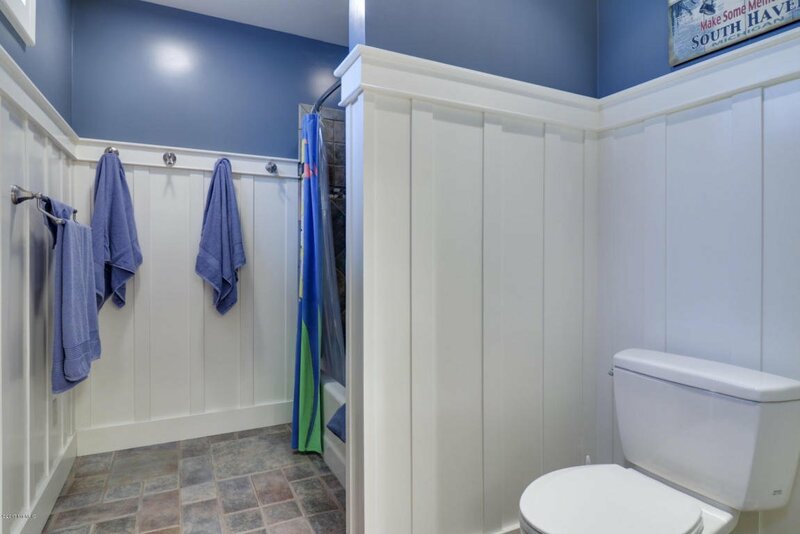 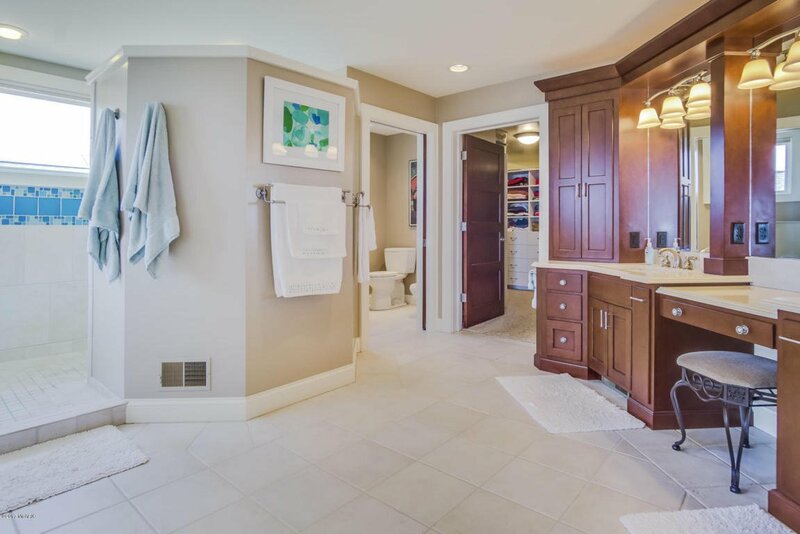 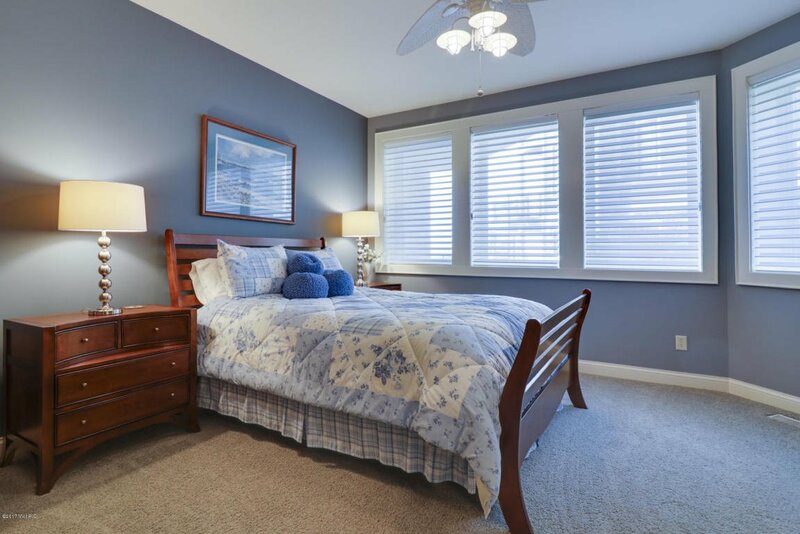 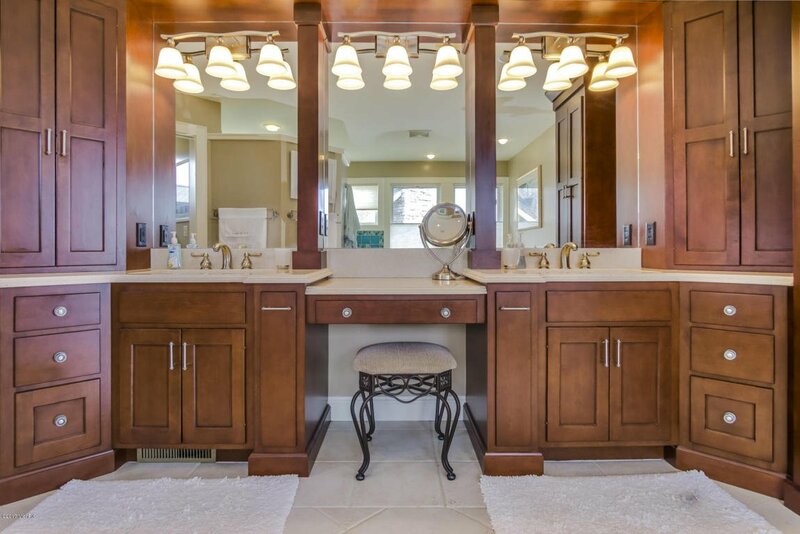 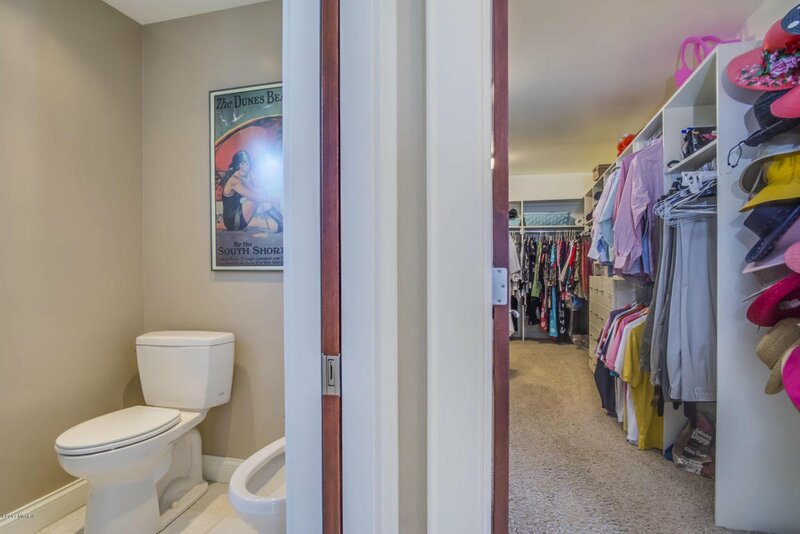 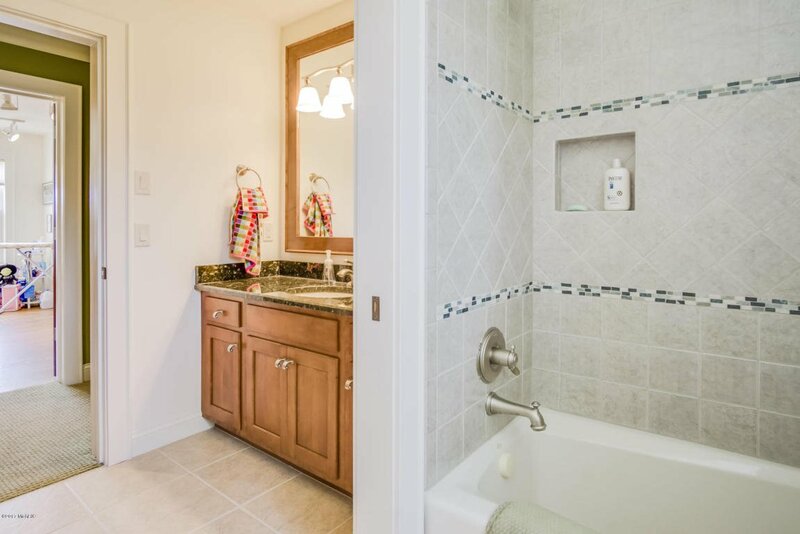 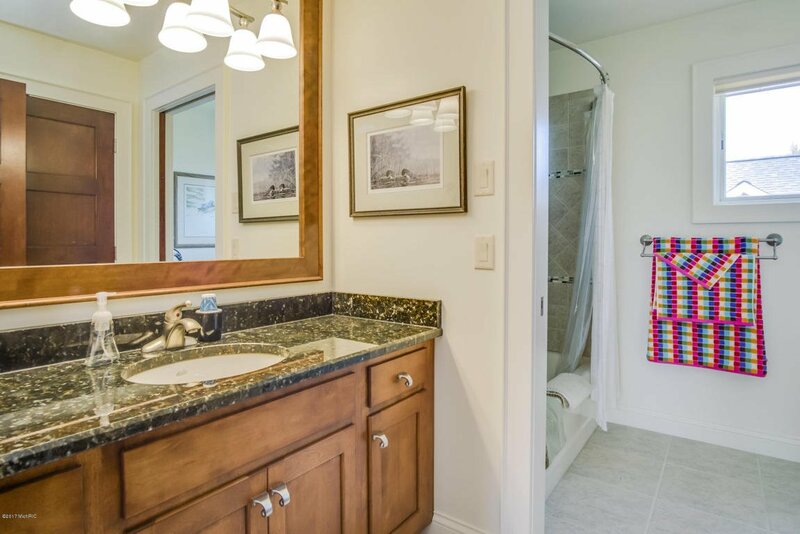 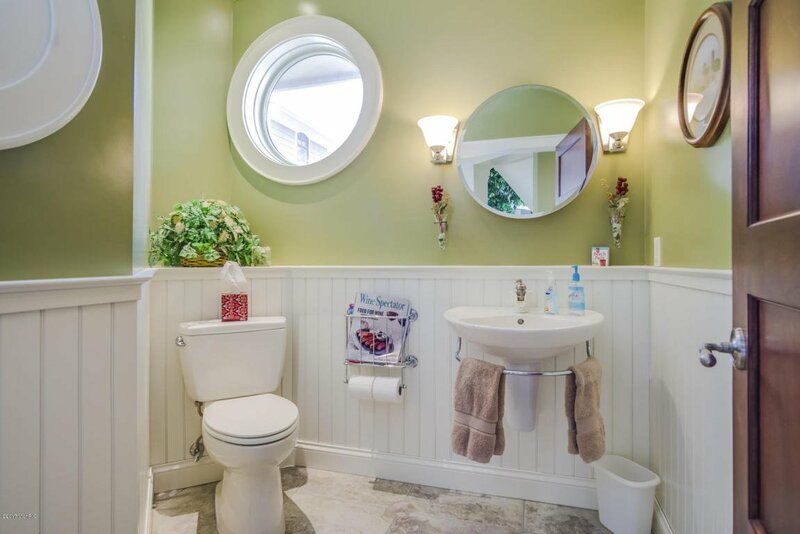 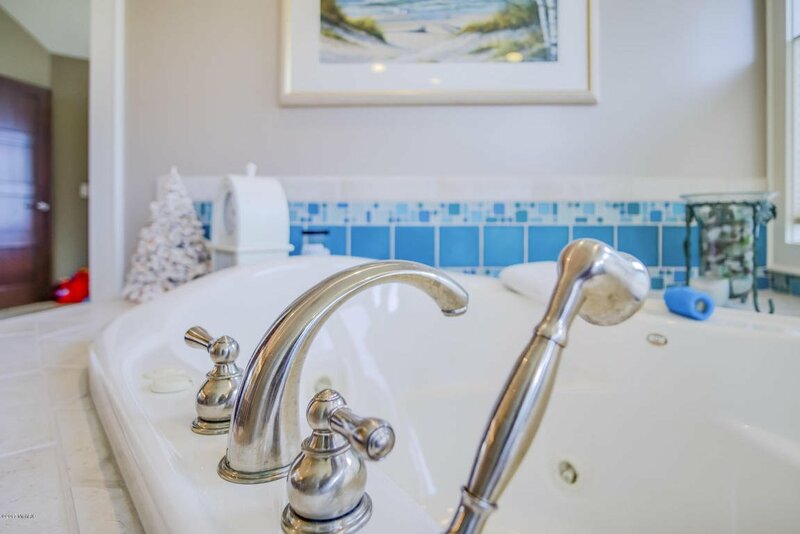 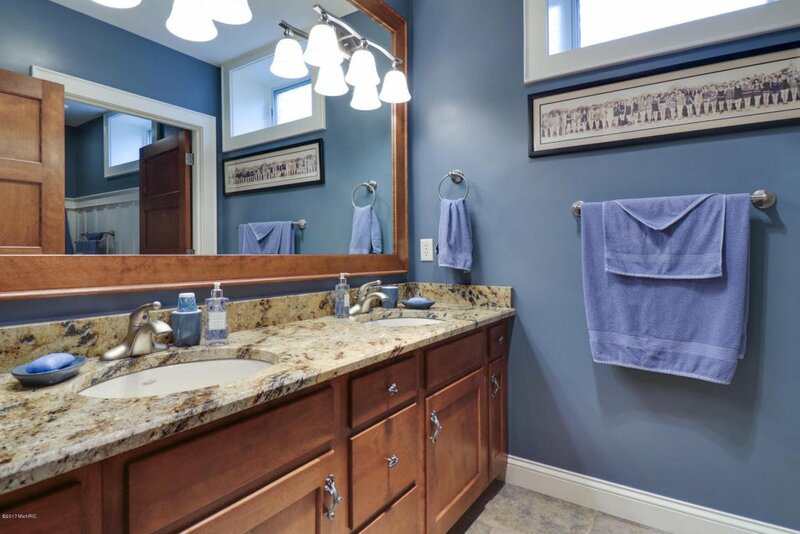 Master bath has heated floors, and commanding walk in closet. 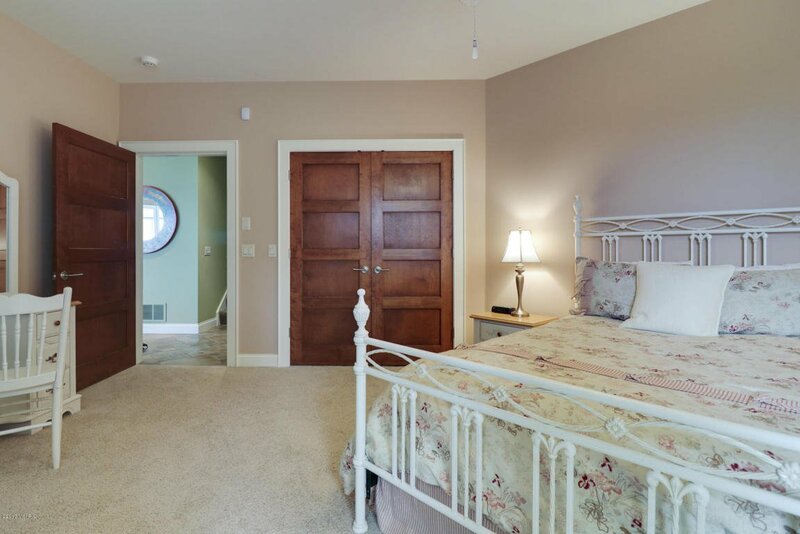 Second bedroom and bath also on second floor. 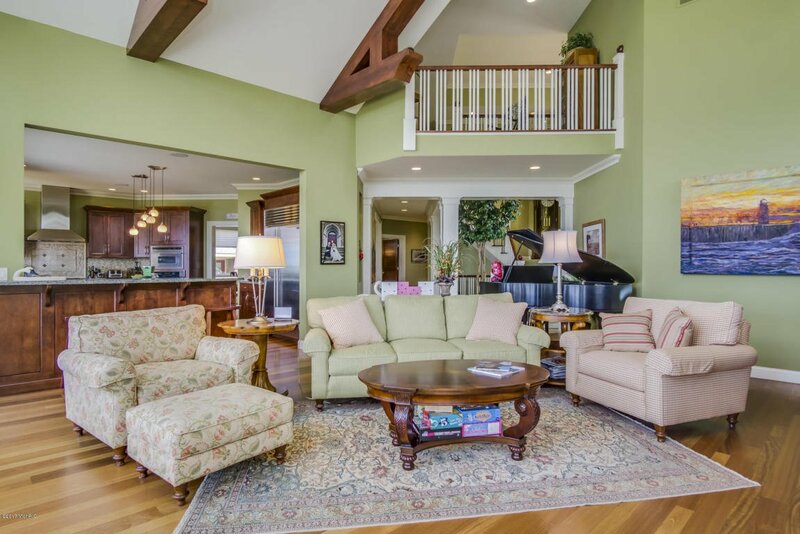 Lower level is perfect for extended family and/or guests. 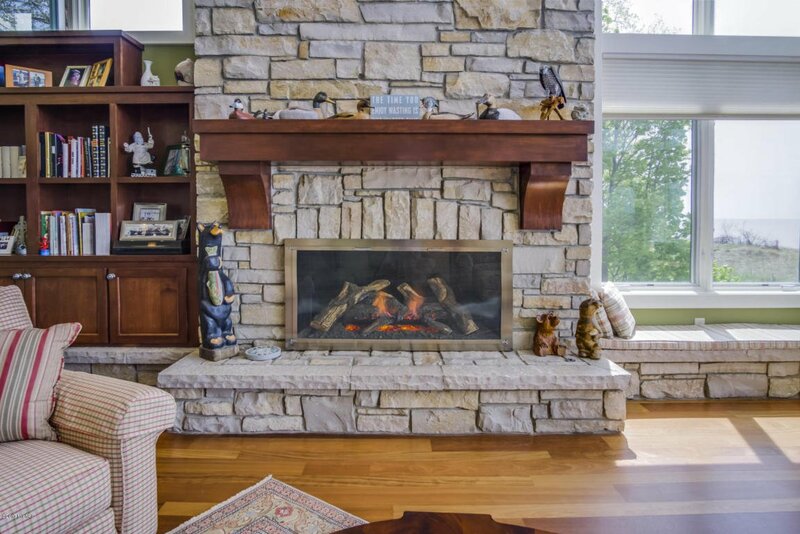 Family room with 9 Ã‚Â½ ft. ceiling, custom masonry natural stone fireplace, surround sound theater system, built in storage & cabinets. 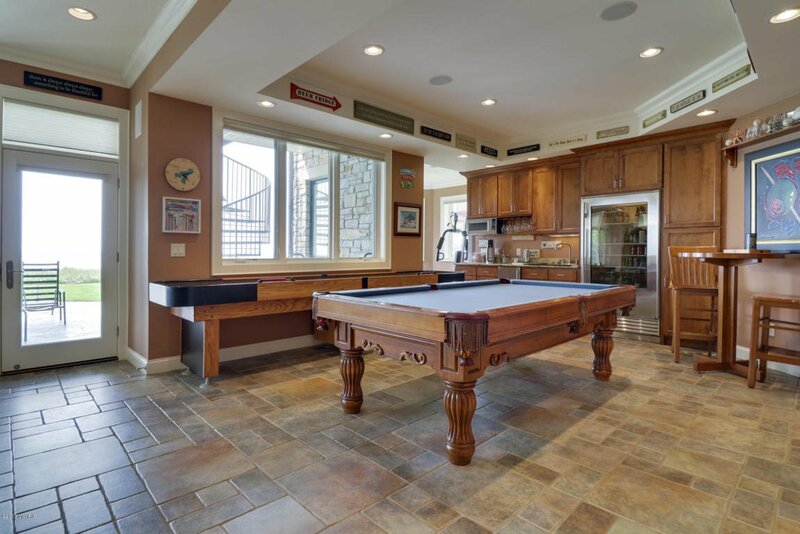 Game room with built in bar complete with sink, sub-zero refrigerator, ice maker and microwave. 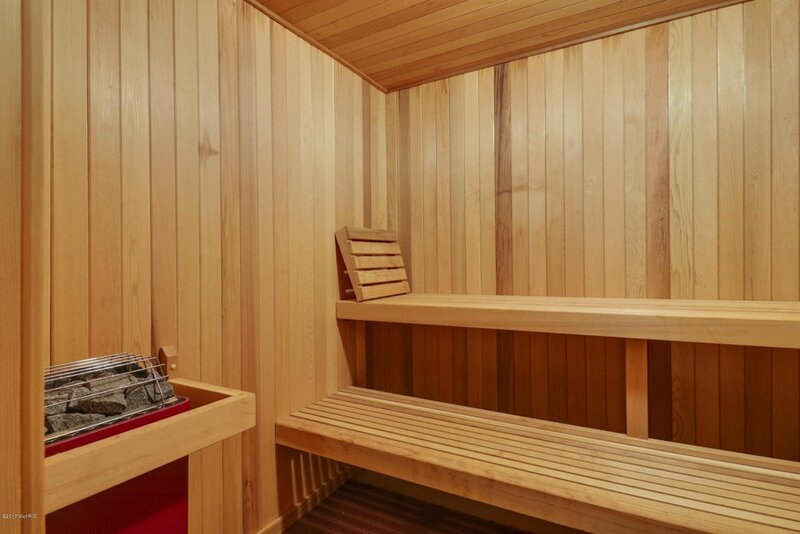 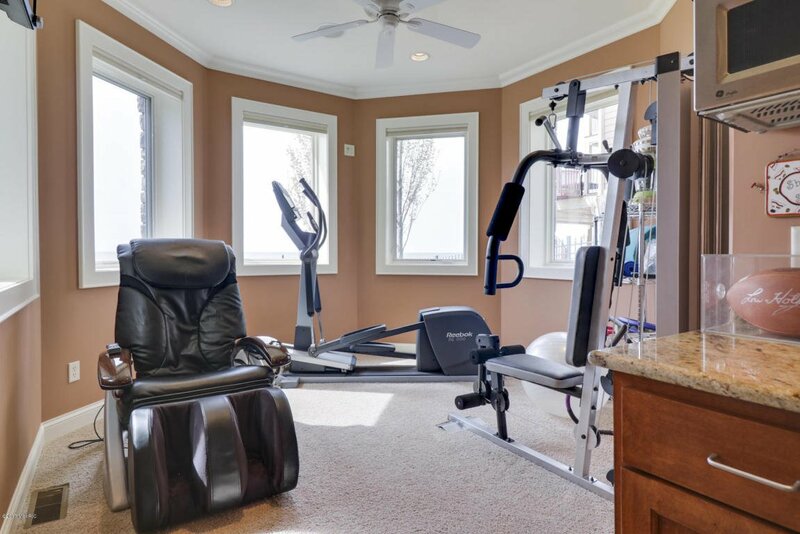 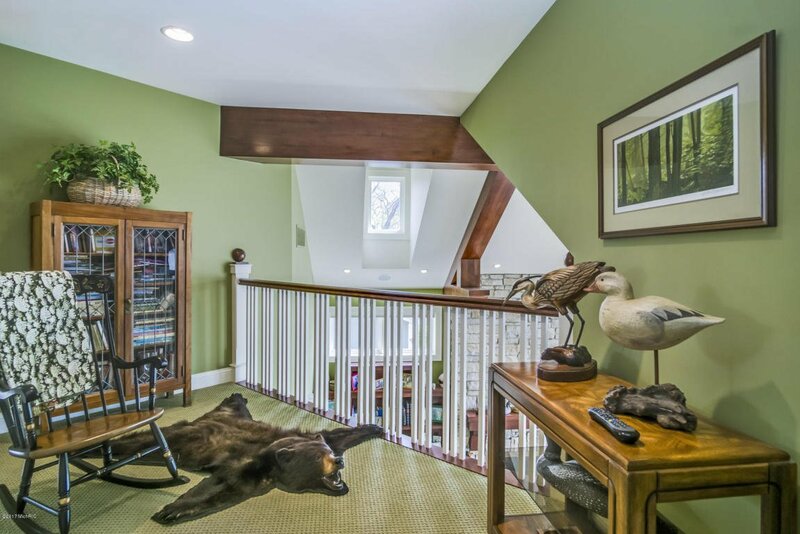 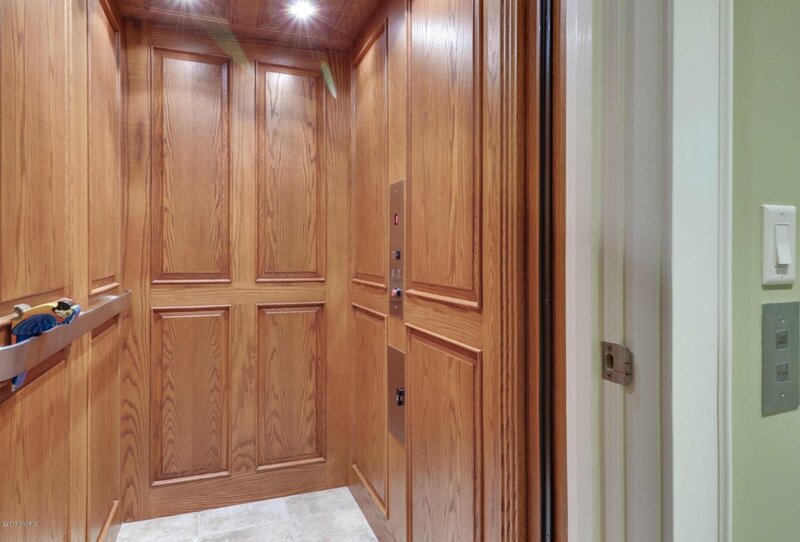 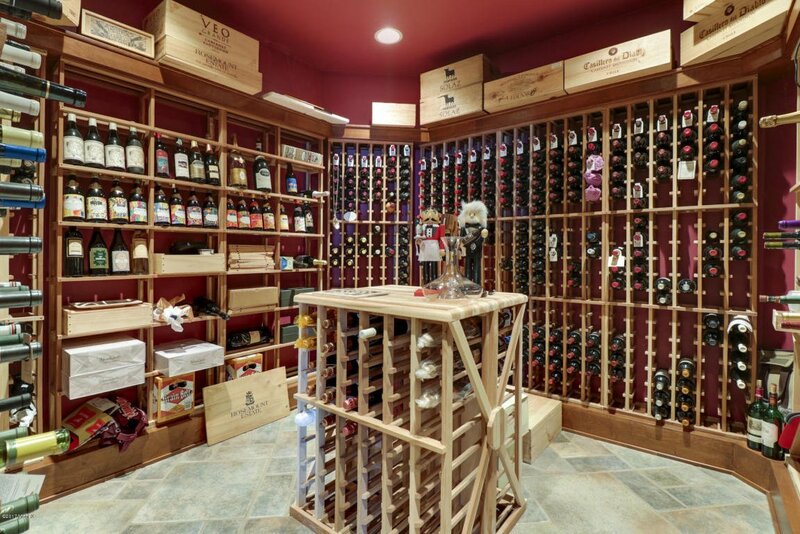 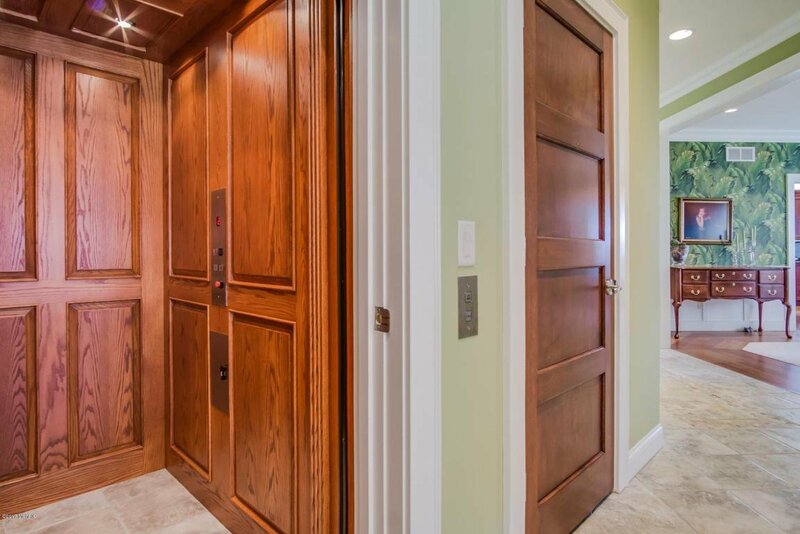 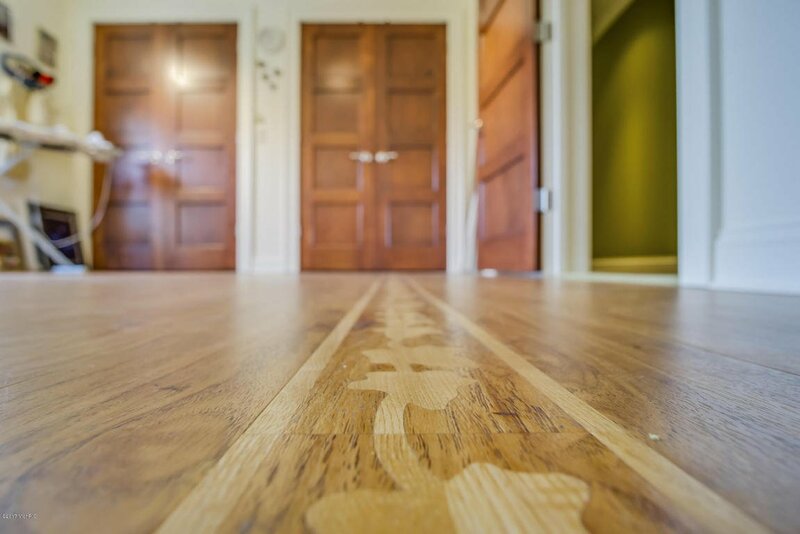 Two additional bedrooms, bath, sauna, exercise room and wine cellar complete the lower walk out level. 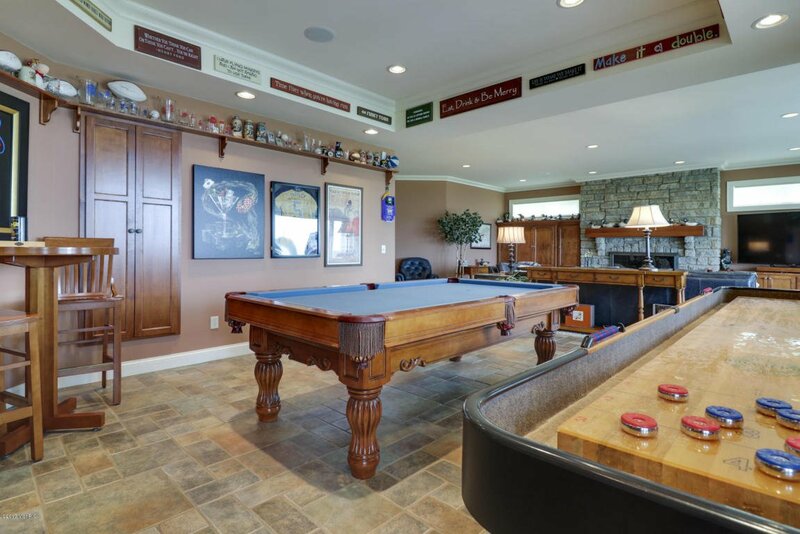 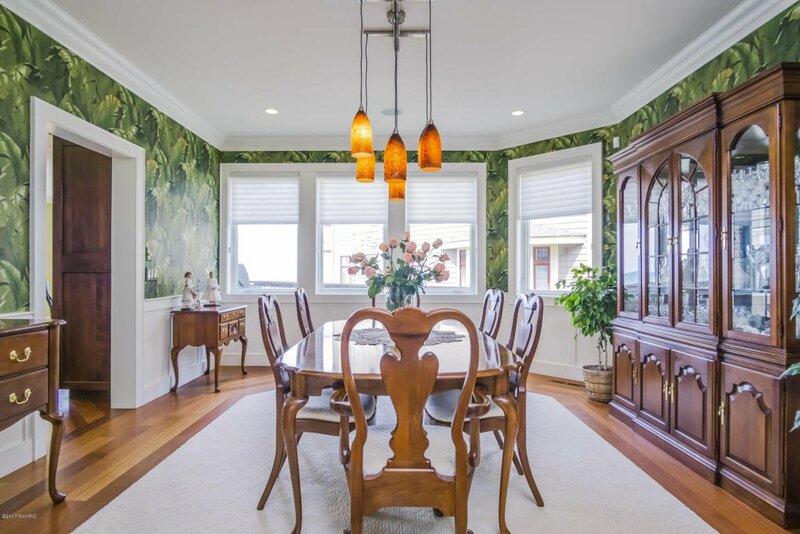 Other amenities include plastered walls throughout, a 1,778 sq. 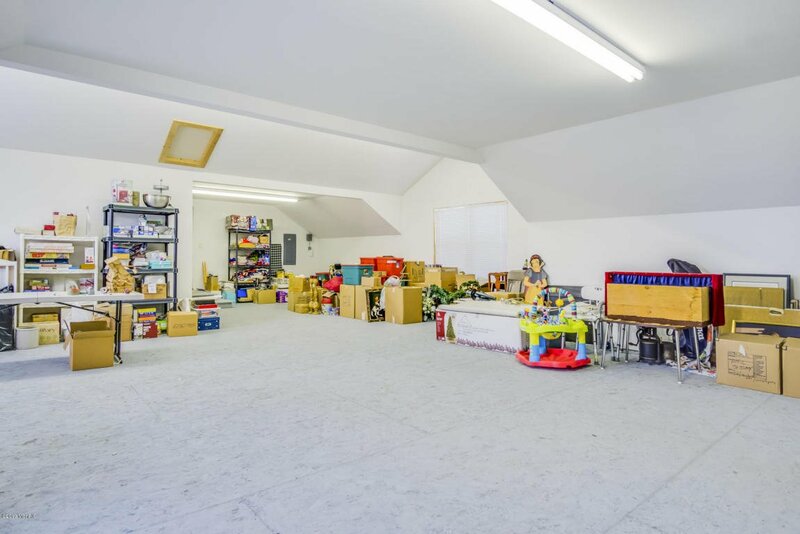 ft. four stall heated garage, and work room that includes concrete ramp to main level and stairs to the attic. 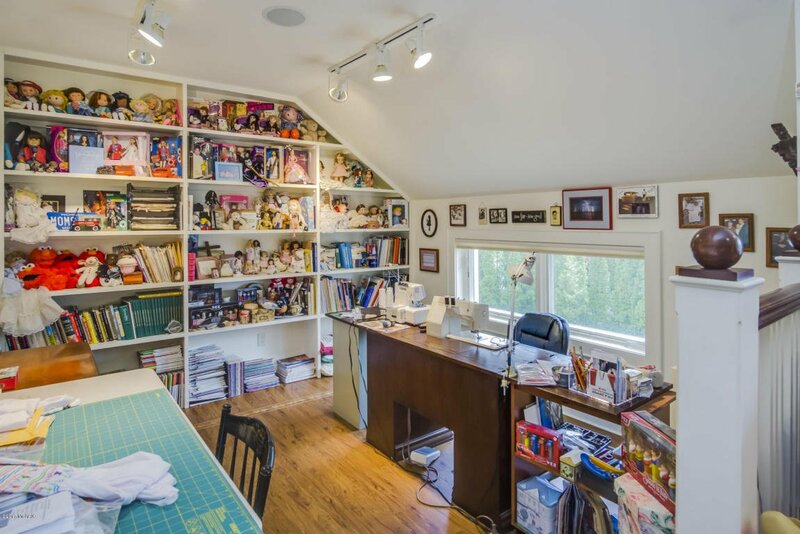 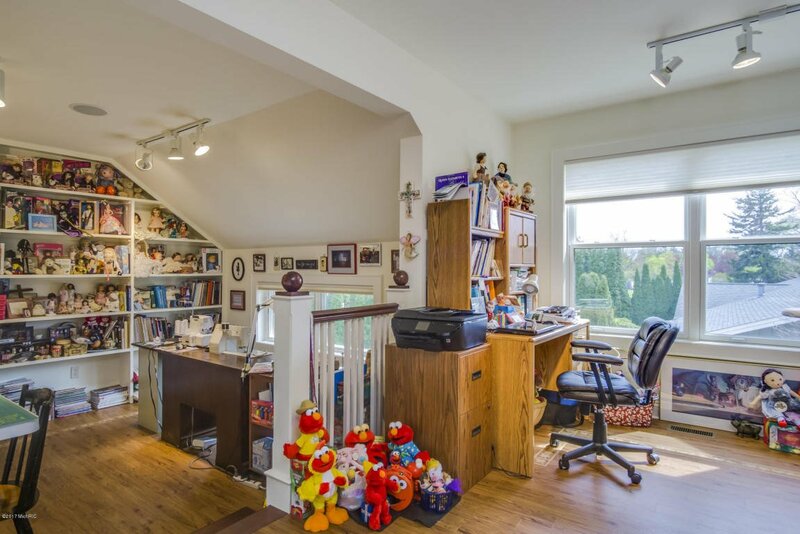 Attic storage has 1,042 sq. 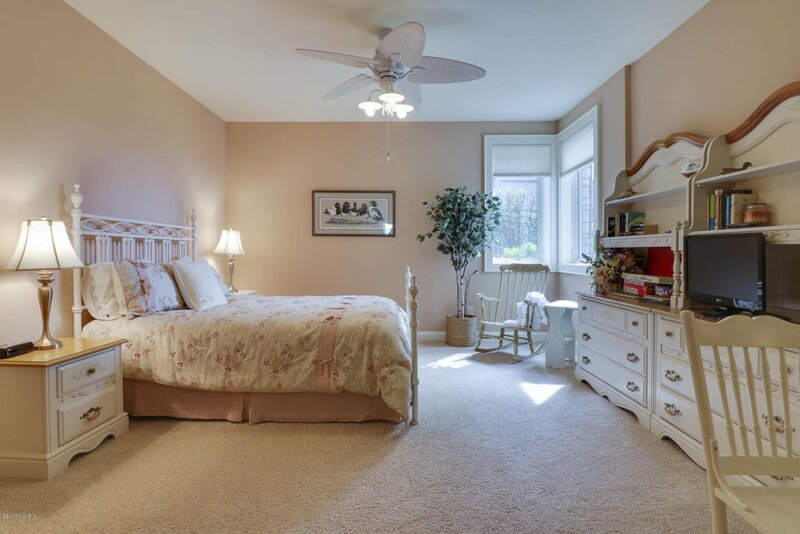 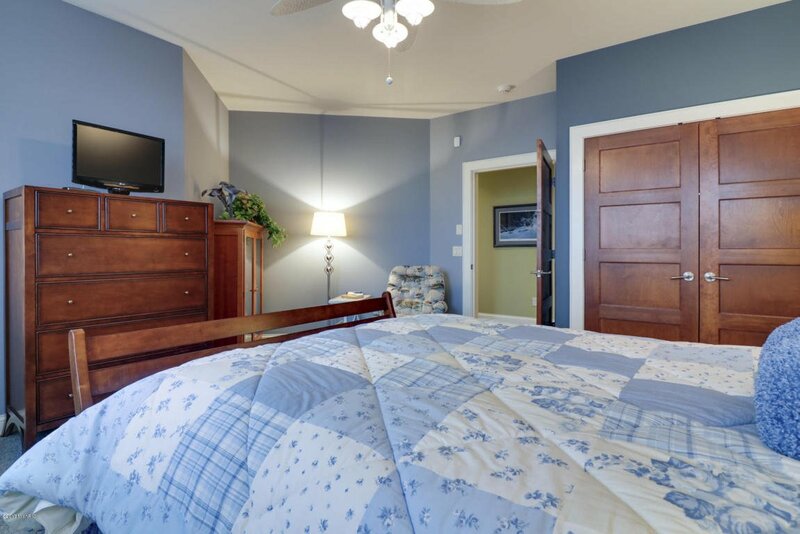 ft. and has been prepped for an additional two bedrooms accessible from the second floor. 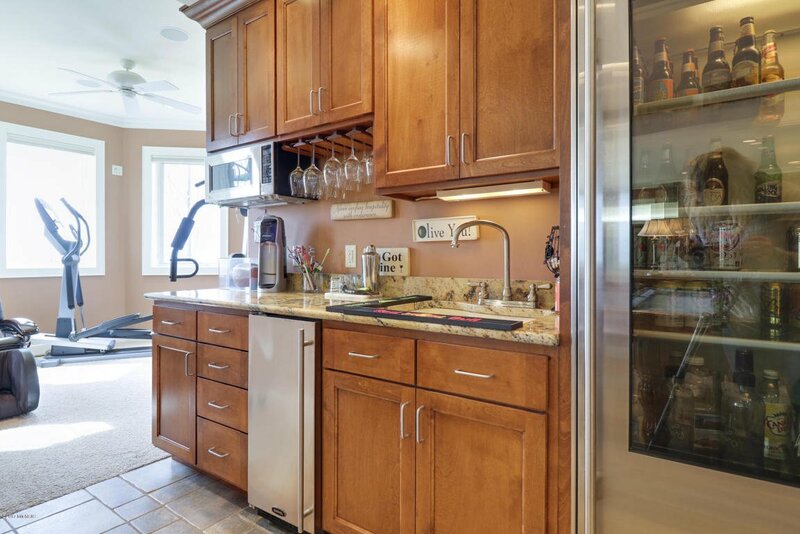 Home has three floor elevator, copper roof over entry and sitting room, natural gas whole house, stand-alone generator, lightning arrestors, ironwood decks, whole house stereo system, water softener, 100 gallon hot water heater with recirculating hot water system. 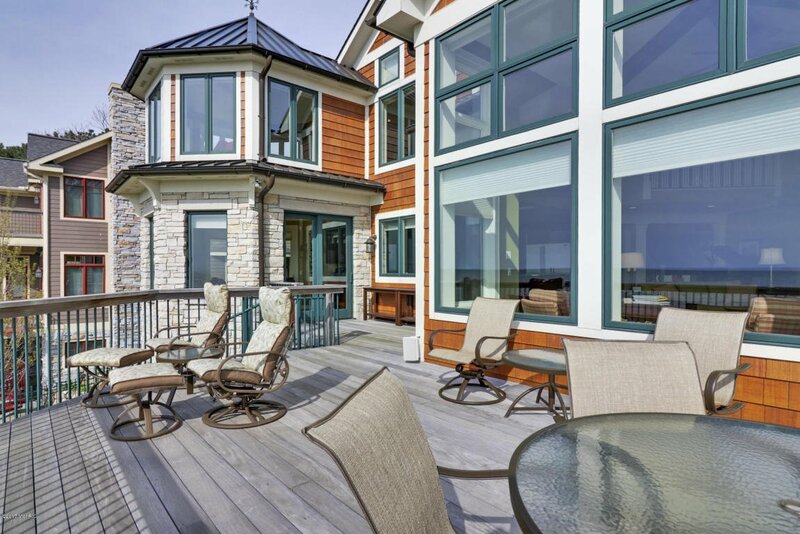 Security system, natural stone and concrete siding exterior, copper gutters, mature landscaping and easy beach access. 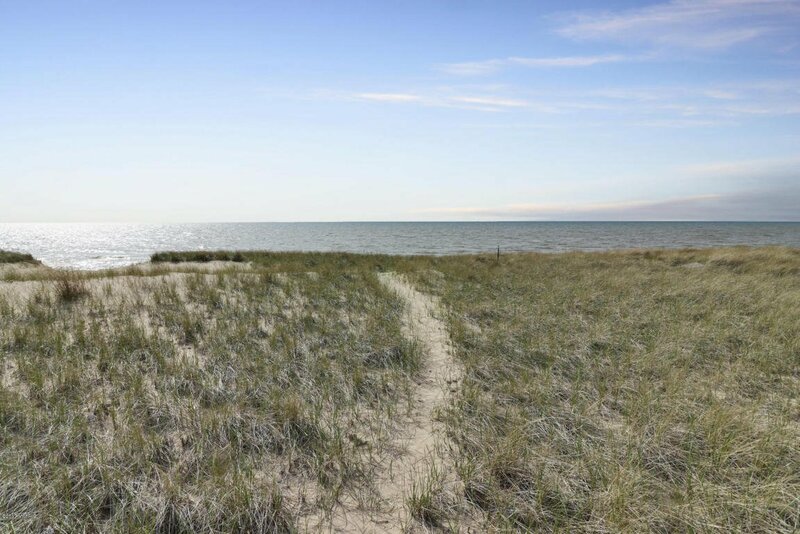 No steps to the water's edge. 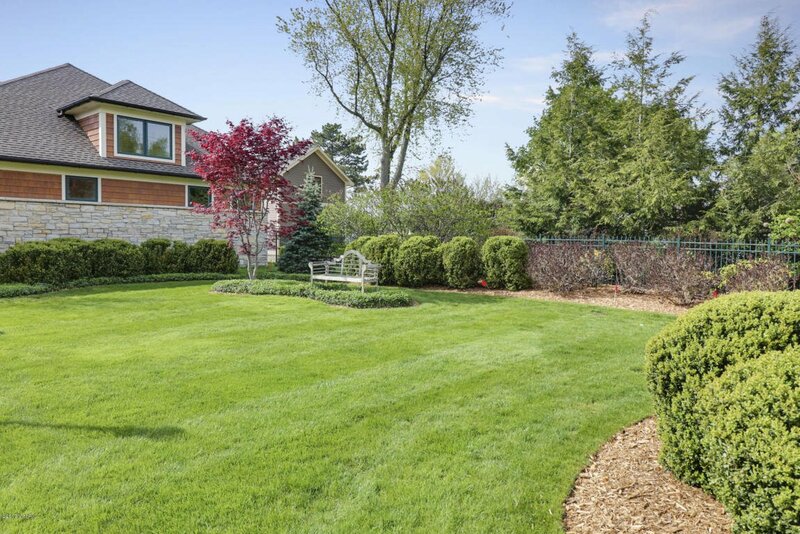 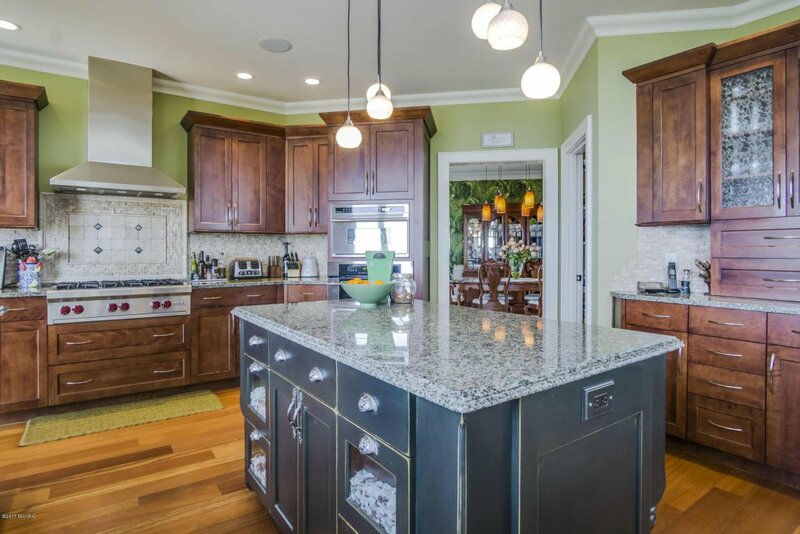 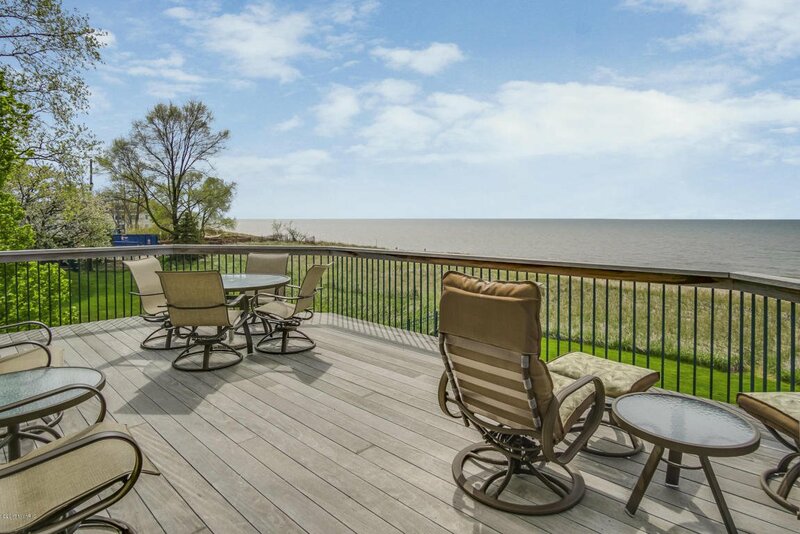 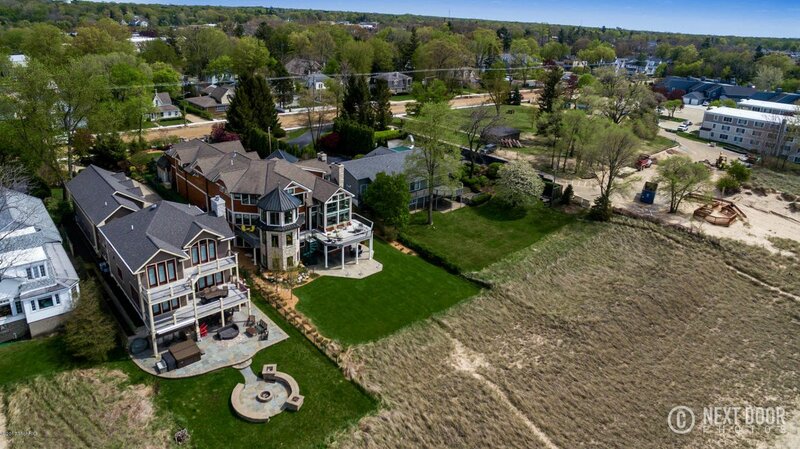 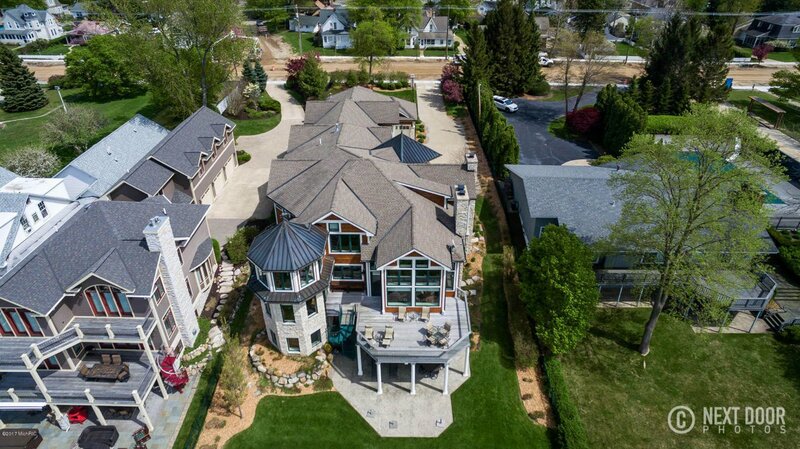 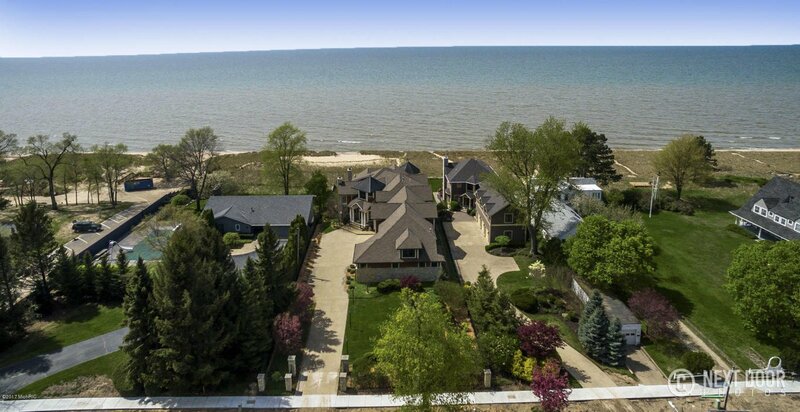 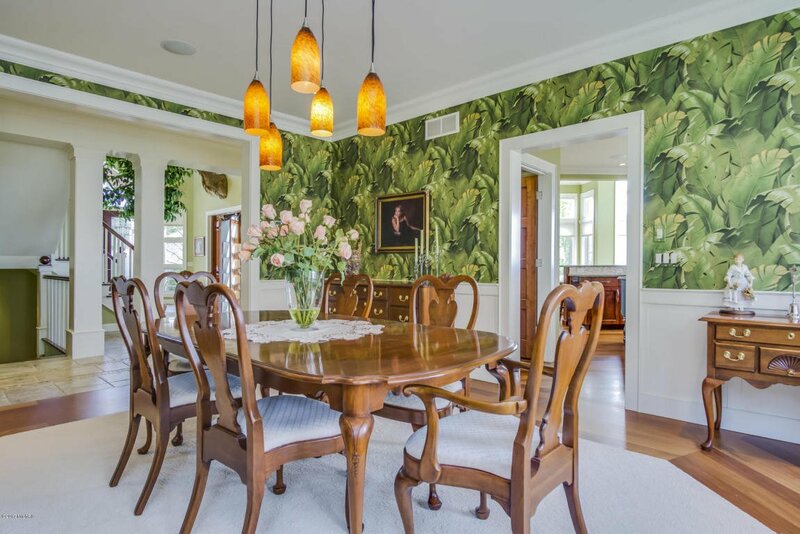 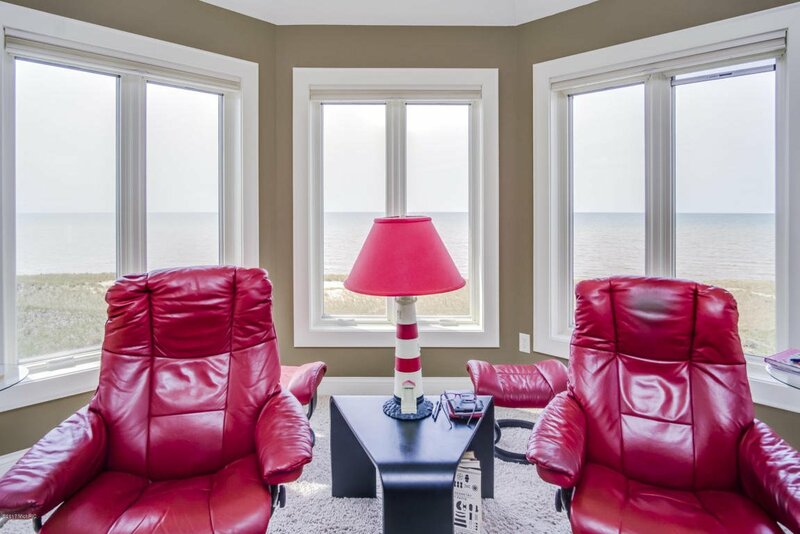 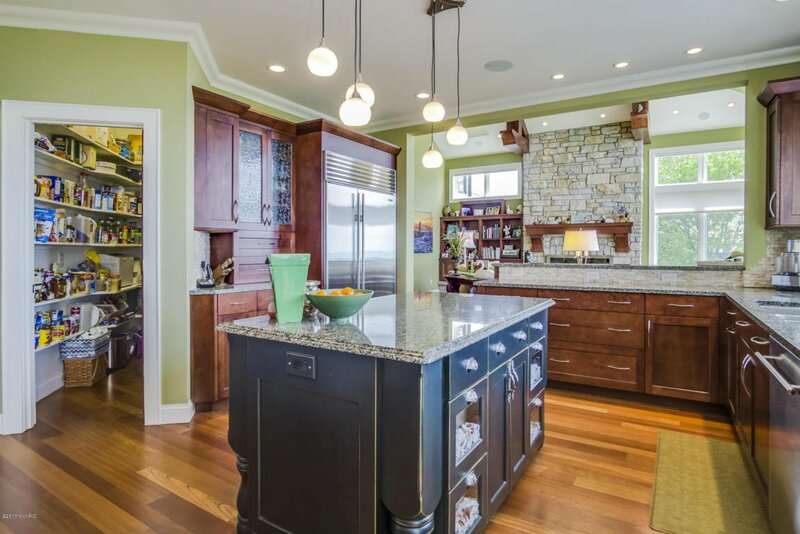 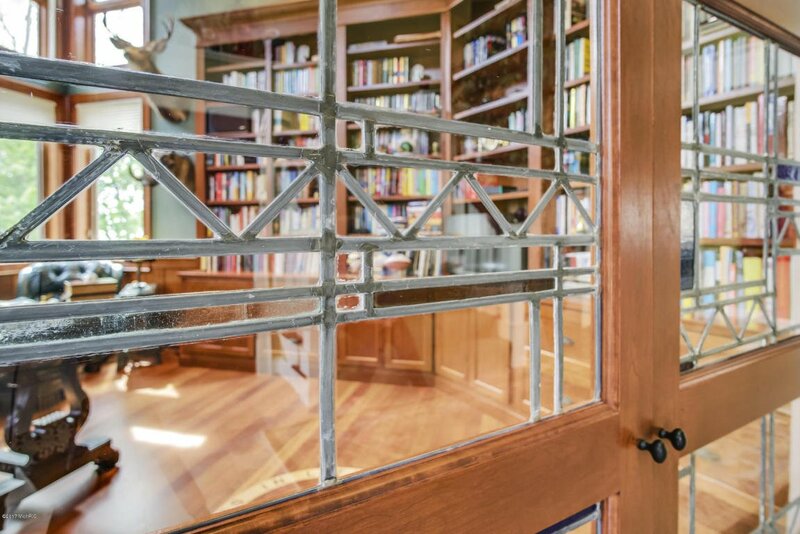 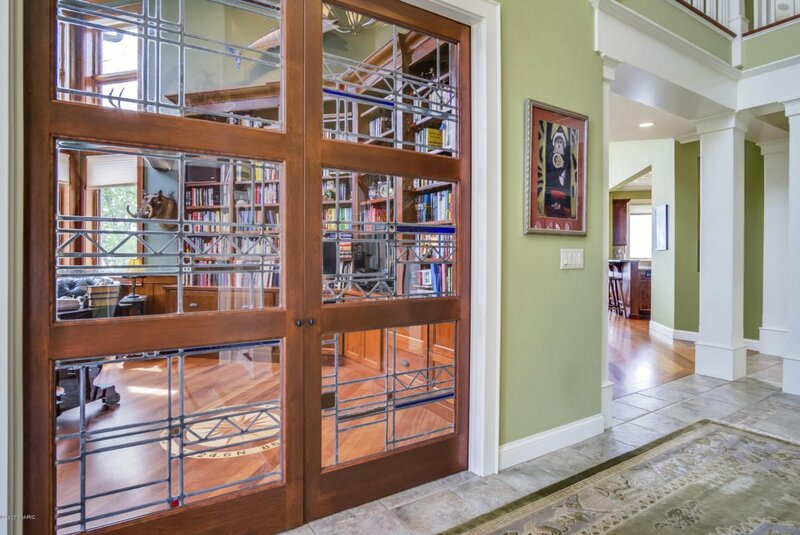 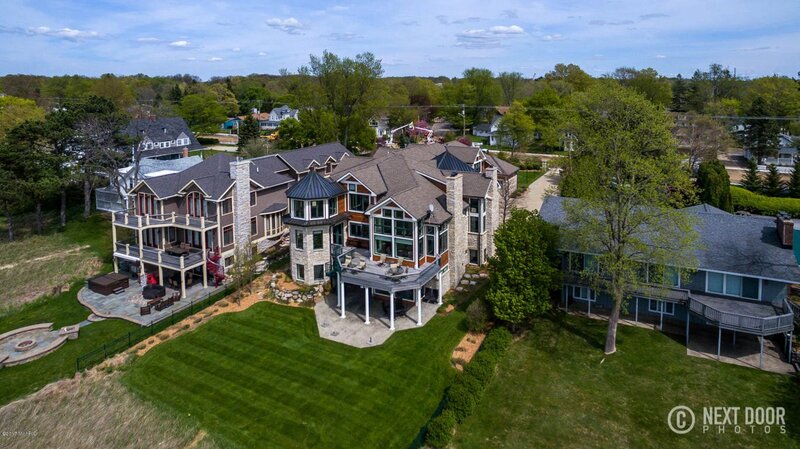 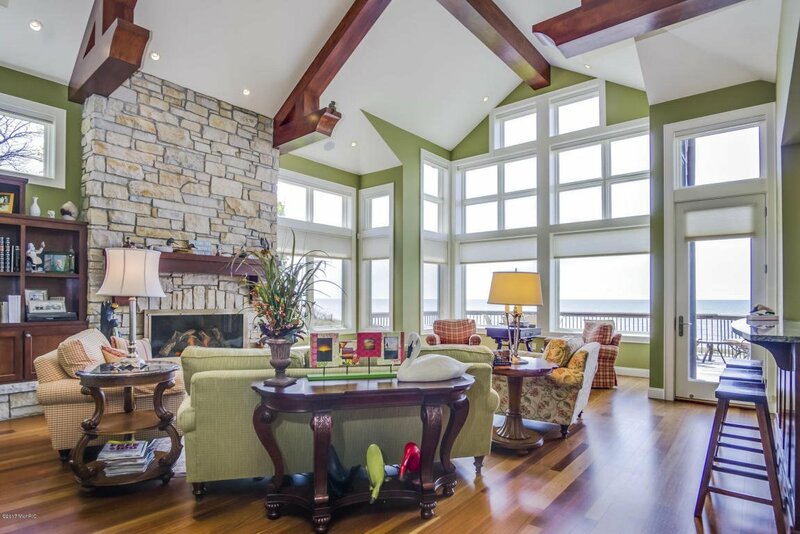 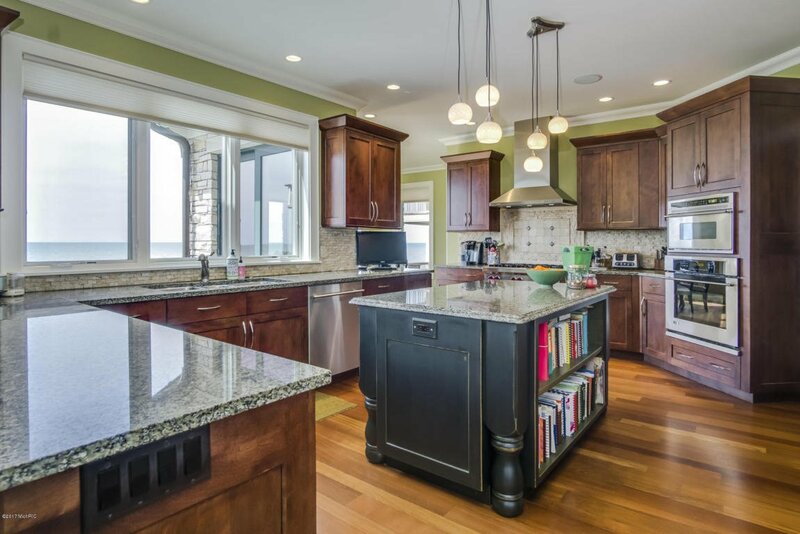 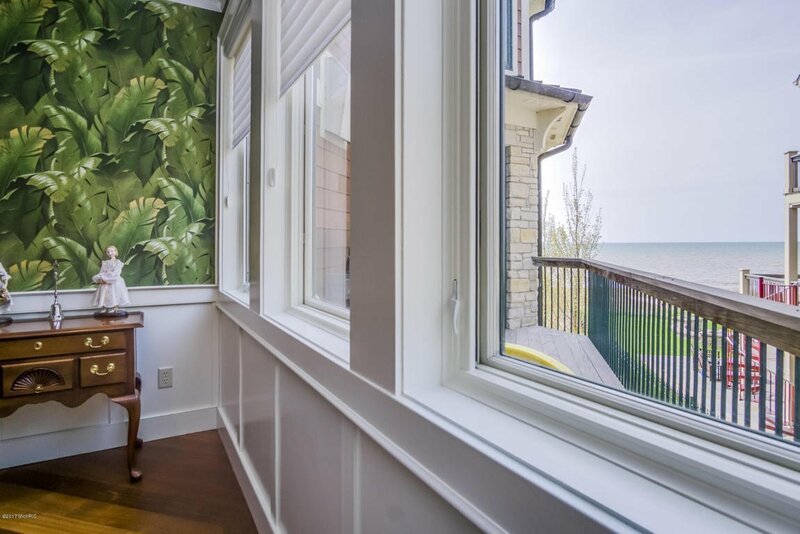 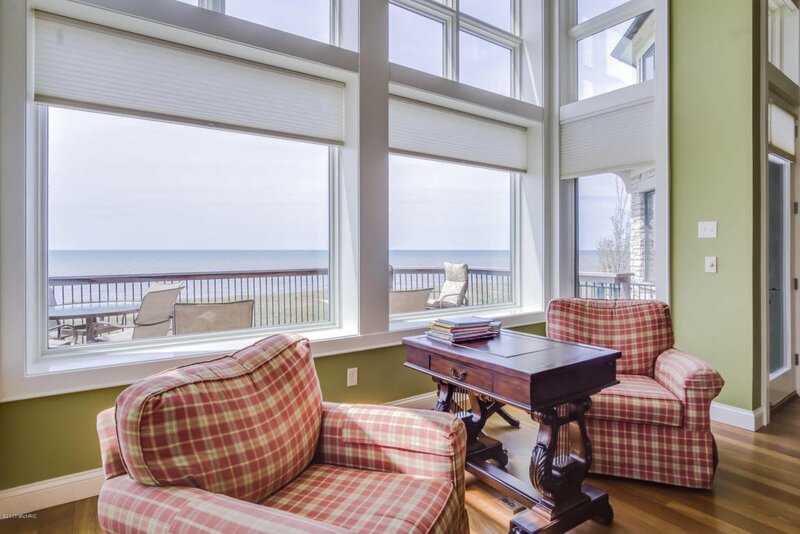 With spectacular views of Lake Michigan from almost every room, this home is an exceptional work of art! 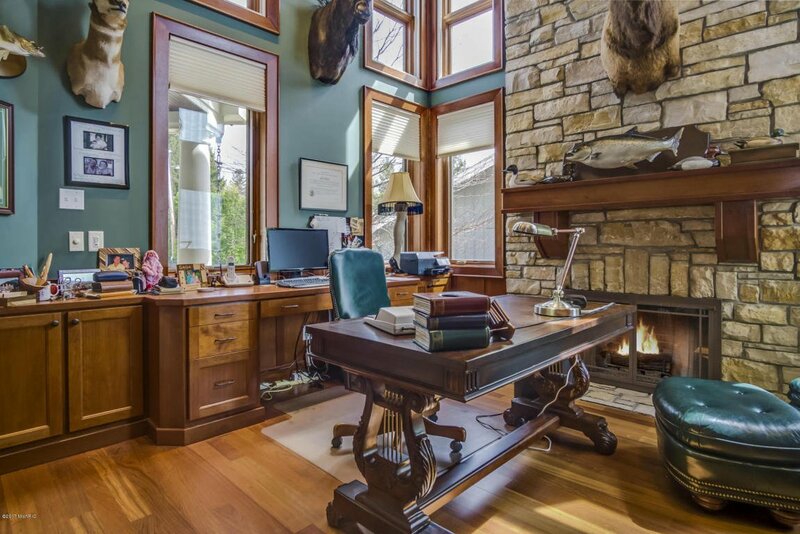 Selling Agent: Jackson G Matson Selling Office: @properties Michigan.